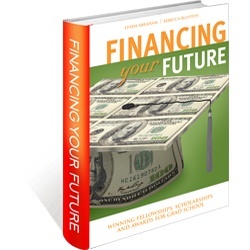 Financing Your Future: Winning Fellowships, Scholarships and Awards for Grad School, an instantly downloadable ebook, shows you how to get the financial support you need to attend the graduate school of your choice. When to apply for financial aid. How to assemble a strong application. Specific program tips and interview advice. You can't successfully apply for graduate school scholarships without insider information on available awards and the application process. In Financing Your Future, Linda Abraham and Rebecca Blustein reveal practical, hands-on advice to help you complete your fellowship, scholarship, and award applications and obtain those critical funds. How do they know? As president and founder of Accepted.com, Linda has advised literally thousands of successful applicants over the last fifteen years, often from the initial school selection and strategy conceptualization all the way through to finalizing the last period of the last essay. At UCLA’s Scholarship Resource Center, Rebecca assisted students at all levels with their essays and personal statements for scholarship, fellowship, and grant applications, from newly-admitted freshmen to graduate school, professional school, and Ph.D. students. They have both seen what works and what doesn’t. Practical tips to guide you through the application process. Additional links and resources about scholarships, awards, and fellowships. Confidence that you are making your best effort.